Summary: Originally the church included a chancel, naos, pronaos and probably an exonarthex. 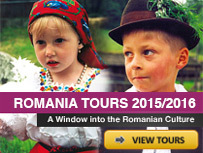 There are three apses at the east end, as in most of the 16th century monastery churches. A tower supported by Moldavian arches rises above the naos. The church of St. Nicholas has clearly been built in two stages. 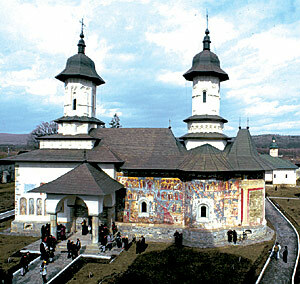 The eastern end is the original 16th century church with exterior frescoes. The western end with the small open porch dates from 1611 to 1617. 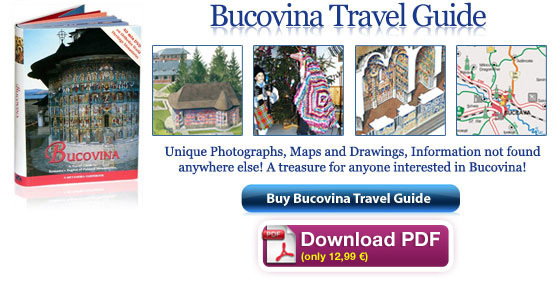 Although the Monastery of Râşca is a princely foundation, and although it is related to the memory of the most famous Moldavian scholar and chronicler of the 16th century, the Bishop of Roman Macarie, it has not enjoyed the fame of the other similar establishments. One reason might be that the monastery was built in a relatively isolated place, which became even more isolated once the nearby town of Baia lost its status of a prosperous governmental and trading centre. 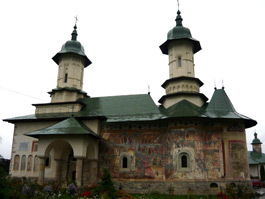 The church dedicated to St. Nicholas is much smaller than its “sisters” also founded by the Prince. It was left unpainted at the time of the Prince’s death – unusual for such a small church – and was decorated with frescoes only in 1552-1554. 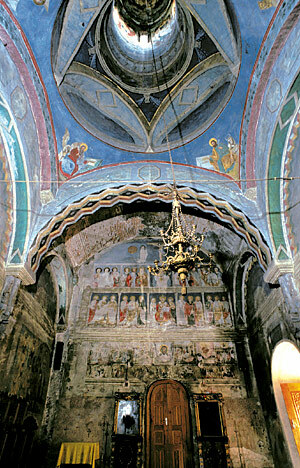 The murals were started during the reign of the second son of Petru Rareş, Ştefan (1551-1552), and completed by Bishop Macarie, who was later buried in Râsca. South façade of the Rasca Monastery. Turks plundered the monastery in 1821, and as earthquakes had seriously damaged the church some time before, it was radically repaired immediately afterwards. The wall between the naos and the pronaos was demolished according to the new fashion of the period. The towers were re-roofed with the bulb-shaped roofs of Baroque inspiration that were preserved during the restoration works of the 1960’s. But, another element that had been added during the 19th century repairs was removed: a third tower, placed between the other two towers. 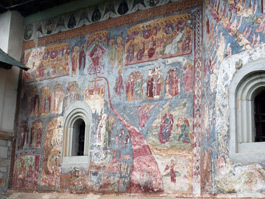 While the south façade and the curved south and east apses of the older half of the church are covered with exceptional frescoes, it is not known if the northern side of the old church was painted or not. 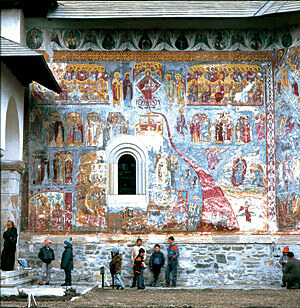 The themes of the south façade frescoes are few, and differ from the other churches with painted exteriors. Under the eaves of the roof is a row of medallions with busts of Monks. General view of the exonarthex. This fact, combined with the image of a church without any towers found on the south façade, has lead some researches to the conclusion that the towers are contemporary, both built in 1611-1617. The entrance to the church is in the middle of the south façade, an exceptional arrangement. The unprecedentedly large exonarthex opens on the left hand side with its two bays of unequal size. The west bay is square, covered with the oblique arches of the Moldavian vaulting system that support the second lantern tower. A very skilful painter decorated the walls and arches with the same Classical trompe l’œil pillars and other architectural features than the east apse. The refined style and colours create a very unusual and harmonious whole. The east bay is narrower. South facade of the Rasca Monastery.